by Larry Moss...Learn to create massive balloon figures using dozens, hundreds or even thousands of balloons. Larry's balloon fabric creation techniques have been used in decor for small rooms and television studios. 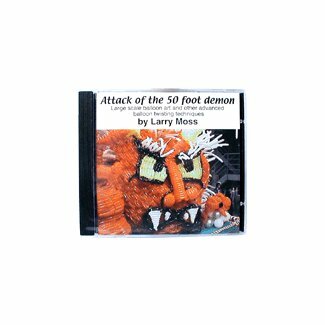 Included on this CD-ROM is the information you need to get started making balloon fabrics, using circular, spiral and criss-cross methods. In addition to web pages full of information, this CD contains over 20 minutes of video to help you out. As an added bonus, two special sections, including balloon busking and figures based on 6-inch hearts, are present on this release of the CD.